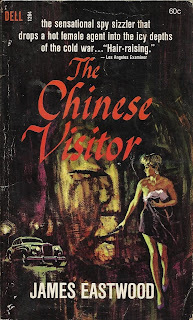 Anna Zordan #1: “The Chinese Visitor” by James Eastwood. Anna has a gypsy spirit. She is a girl who loves excitement, danger, and adventure. She’s accidentally on the scene of an assassination in a cemetery, of all places, when a visiting Chinese diplomat is murdered. As the police notice her, she is grabbed, but fights back, and ends up in jail. It isn’t long before a rich suitor bails her out; however, it’s done on orders from a high official in British espionage, who has been following the girl’s trail since her mother and father (British agents) were murdered. Once released, she finds a killer in her apartment, and in a struggle she kills him. Contacting Serratt, a British official, she thinks she’s heading for jail, but instead is recruited into British intelligence. Now she has a chance to do even more about her parents’ death. The beginning was very similar to the movie, POINT OF NO RETURN (a remake of NIKITA, which I’ve never seen), in many respects: from the murder, to her jail time, and Serratt’s bringing her into the agency. Even to the music, except in PONR it was Nina Simone, in TCV, Anna prefers classic music. There is also a similar kissing scene between Anna and Serratt, as between Nina (Bridgett Fonda’s codename) and Bob (her government sponsor). But after the story truly gets going, all similarities cease. There is enough action to keep the story interesting, though the author spends too much time with the enemy agents, and we don’t see enough of Anna Zordan. They do travel to different locations, and the final action takes places in a mountain hideout almost impossible to reach. There are three stories in the series, so maybe we see more of Anna in the next two stories. This first entry in the series is well worth reading, just for its similarities to POINT OF NO RETURN. A Fun Read. 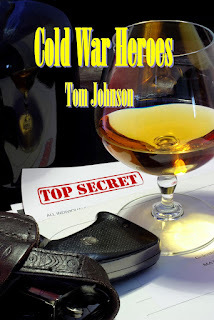 COLD WAR HEROES & THREE GO BACK by Tom Johnson: Just off Contract and looking for a publisher, preferably a European publisher for COLD WAR HEROES that can place the book in French and German translation and release in Europe. COLD WAR HEROES is a military satire set in France during the 1960s at the height of the Cold War. 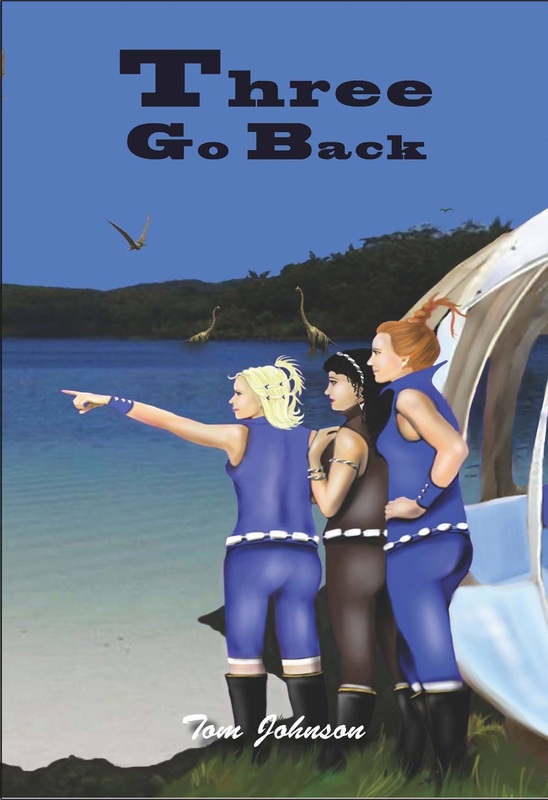 THREE GO BACK is a YA SF novel about three teenage girls who accidentally go back in time, visiting the different epochs of our world’s evolutionary history. Order by 7:30pm EST Monday, December 21st using Priority Mail for Christmas Eve Delivery. 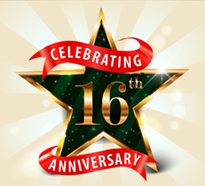 Radio Archives is celebrating 16 years of creating great products and we are celebrating with our biggest sale ever! Over 100 Pulp reprints, DVDs, and Books at 75% off the retail price until December 31st. 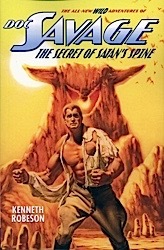 75% discount on 24 Doc Savage double novel reprints from Nostalgia Ventures. 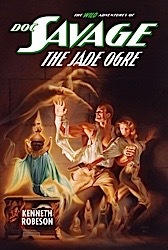 75% discount on Doc Savage: The Lost Radio Scripts. 75% discount on 8 DVD sets of Classic TV shows from Nostalgia Ventures. 75% discount on 3 Old Time Radio sets from Nostalgia Ventures. 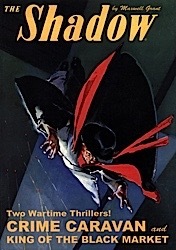 75% discount on 21 The Shadow double novel reprints from Nostalgia Ventures. 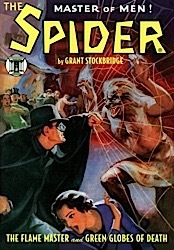 75% discount on 18 The Spider double novel reprints from Girasol Collectables. 75% discount on 10 Modern Weird Tales magazines. 75% discount on 26 Audiobooks from Galaxy Press. 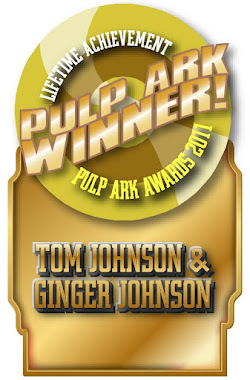 75% discount on 26 Pulp books from Galaxy Press. Known for breaking new ground in radio and entertainment, Dragnet was truly a pioneering program in many ways. This was most evident in the actual stories told in each episode, some sentimental, some brutal, all as realistic as show star and creator Jack Webb could make them. Strong stories and great characterizations make up every show featured in Dragnet, Volume 11. The story featured in each episode is, as noted in the famous opening narration, “…true.” Although many shows focused on lesser crimes, Dragnet did not shy away from violence or topics thought forbidden. This program was in every sense a true police procedural and dealt with crimes of all sorts. Dragnet was one of the first radio shows to deal with crimes involving sexual motivations, true psychological issues, drug use among juveniles, and even the murder of children. 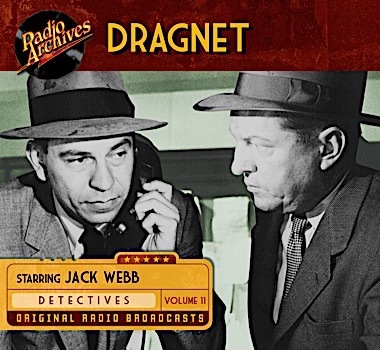 Never gratuitous in its portrayal, Dragnet dealt with all crimes the same way that Jack Webb delivered Joe Friday’s lines - honestly and starkly. The realistic interplay of characters on Dragnet captures a listener’s attention, giving fans that almost fly on the wall feeling as they listen to Friday and his partner investigate and interrogate. Enjoy episodes featuring honest, realistic stories and great performances on Dragnet, Volume 11. Give the gift of great entertainment with a gift certificate from Radio Archives! Available in any amount you choose, it's always a welcome gift for anyone who loves classic radio entertainment or the thrilling adventures of Doc Savage and The Shadow. Gift certificates are available to be sent via e-mail or standard First Class postage - your choice - and, what's more, you can choose multiple recipients all at the same time. Imagine having all of your shopping done all at once...with just a few clicks! 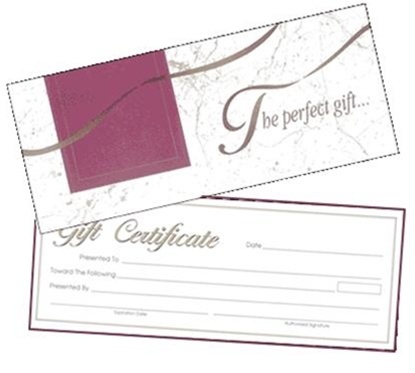 To order, simply add a gift certificate to your cart, just as you would any other product. Once you have done so, you'll be able to choose the exact amount, as well as choose other ways in which you can personalize your gift. Before creating cinematic masterpieces like "Citizen Kane", "The Magnificent Ambersons", and "Touch of Evil", wunderkind Orson Welles had already established himself on stage, performing with the legendary Katharine Cornell in productions of "Romeo and Juliet" and "Candida" in 1934. He then teamed up with producer John Houseman in 1935 to form a stormy and intense three-year partnership collectively known as the Mercury Theatre that, according to radio historian John Dunning, "created some of the most startling and talked-about theater New York had seen in decades." Producer Houseman was chiefly responsible for paring down the "fat Victorian monsters" that served as the material for much of the series' plays (he would later hire a young writer named Howard Koch to take over the scripting chores), and conductor Bernard Herrmann provided the excellent scoring for the various productions, there was very little doubt that the show was an Orson Welles production. That is to say, the wonder that was Welles accepted a good deal of the credit as director, writer, and star. Listening to broadcasts of the show, even today one can't help but be a little awed by many of the productions, with even the lesser shows always having a little something distinctive to recommend them. One would also be remiss, however, if it wasn't pointed out that Welles' repertory cast -- Martin Gabel, Ray Collins, George Coulouris, Everett Sloane, Alice Frost, and Agnes Moorehead, to name only but a few -- deserve every bit of the credit for the fine acting that permeates each and every installment. 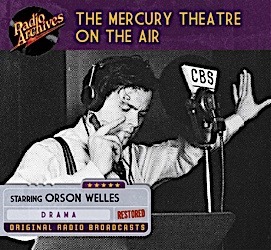 Radio Archives is pleased and proud to introduce this impressive collection: ten immortal broadcasts of "The Mercury Theatre on the Air" as originally heard between July and November of 1938. All of the programs have been transferred directly from the highest quality first generation master recordings and painstakingly restored for the best possible audio quality, making these the finest sounding versions of these broadcasts ever made available to the public. When we look back at American family life in the late 1930s, many of us view it not through the eyes of reality but, instead, thru the rose colored glasses of popular culture. If you were young yourself at that time, you have a more realistic memory of those years - but, if you're a baby boomer and beyond, you're more likely to imagine a typical American home, circa 1940, as being in Carvel where a teenager named Andy Hardy lives: clean, pleasant, prosperous, and where every challenge, crisis, or misadventure is resolved in time for a happy ending - complete with the occasional musical number. In its first incarnation, The Adventures of Archie Andrews was a daily fifteen-minute radio series, aired over the Blue Network. Ratings were respectable and, after a brief move to a half-hour weekly slot, the five-a-week format returned on Mutual in 1944. But the series really hit its stride in June of 1945, when a largely new cast was introduced and it premiered over NBC in a Saturday morning slot that it would happily occupy for eight years. For the majority of the Saturday morning run, Archie was played by Bob Hastings, a talented young actor who had already made his reputation playing juveniles on dramatic programs. Woman-hating food-loving Jughead was played by Harlan Stone, perky Betty was played by Rosemary Rice, and the honey-voiced Veronica was played by Gloria Mann. If you were looking for subtlety or teenaged angst, you were never going to find it on The Adventures of Archie Andrews; in typical sit-com fashion, the plots usually revolved around some simple misunderstanding that quickly turned into bedlam. Aimed straight at a pre-teen audience, the programs were designed to be nothing more than loud, goofy, and fun - and, from the reactions of the studio audience that attended each live broadcast, the show was clearly adored by its listeners. 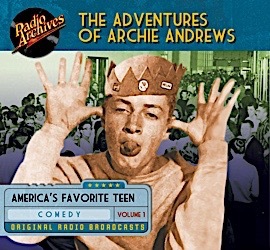 The Adventures of Archie Andrews, a seven-hour collection from RadioArchives.com, offers fourteen original NBC broadcasts taken from the original network master recordings and fully restored for sparkling audio fidelity. If you've enjoyed our other comedy collections - and especially if Archie and his pals were a big part of your youth - this is a collection you simply won't want to miss. With boiling lead that stilled men’s tongues and bombs that mangled human bodies, the hooded hordes threatened America. Their power was spreading from State to State like a hideous blight. Their spies were everywhere—and against this dread secret society went the Man of a Thousand Faces, into a danger that even he did not foresee. The exploits of Secret Agent "X" originally appeared in the magazine of that same name under the pen name of Brant House. 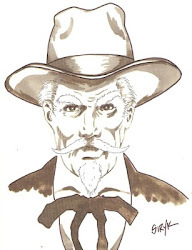 "X" was the creation of author Paul Chadwick. For Secret Agent “X”, it was decreed that he would pit himself against villains who were maestros of unbridled horror. Melodrama was the rule of the day. 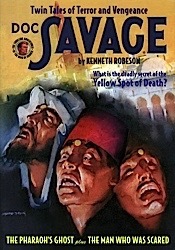 But the unknown “X” plunged into maelstroms of raw bloodlust undreamed of by The Shadow and Doc Savage. His foes were truly depraved. Terrorists. Torturers. Kidnappers. Stranglers. Arsonists. These were the types of tabloid master criminals our nameless hero hunted. 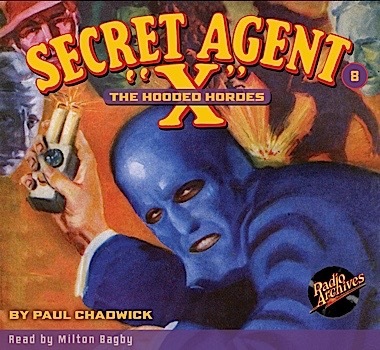 Follow the Man of a Thousand Faces as he confronts the menace of The Hooded Hordes, ripped from the pages of Secret Agent “X” magazine, October 1934 and read with chilling intensity by Milton Bagby. Out of the blue it struck––that dread, mysterious force, dealing death, destruction and misery to millions. America found herself stripped of her strongest defenses as battleships, huge guns, skyscrapers, factories and transportation systems crumbled to dust before the voracious flame. No one could tell where it came from; where it would next strike; no one was safe from its hot, devouring maw. An entire nation stood crippled, paralyzed by panic as Operator #5, alone, fought to save America from the red ruin loosed upon it. They called him Operator #5—undercover agent, man of many identities, patriotic protector of America’s sacred shores. Working for the U. S. Intelligence Service, his job is to root out subversive elements and stand as the first line of defense against foreign invasions from all quarters. Aided by street-smart Tim Donovan and newspaperwoman Diane Elliott, Jimmy Christopher was the James Bond of the 1930s! James Christopher did not technically belong to the U. S. Secret Service. He was a top agent for an America’s unnamed counter espionage agency. It was in his blood. His father, John Christopher, retired from the same agency years before. Answerable only to his superior, Z-7, and carrying a letter from the President of the United States identifying him as Operator #5, Jimmy Christopher played for keeps. He carried a rapier sewn into his belt, and in a golden skull hanging from his watch-chain was a reservoir of deadly poison to be taken in the event of capture. 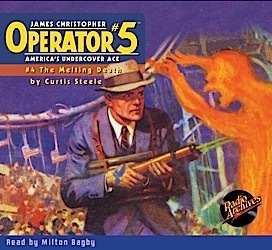 The Melting Death was originally published in the July, 1934 issue of Operator #5 magazine. Read with tightly-wound tension by Milton Bagby. has a wide selection of Old Time Radio - Audiobooks - Pulps and lots more at great prices. More than 50 discounted items, supplies limited. Congratulations on Radio Archives work! You have truly amazing material. All best wishes for success. Thank you for your wonderful offerings of classic pulp novels. 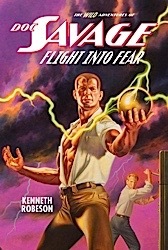 I discovered your Doc Savage 2 in 1 Pulp Reprints at my local book store and snatched them all up for my wife. After many wonderful re-reads (she truly loves them), I decided to visit your website to see if I could get some more. Thank you for your good work. I've been receiving your newsletter for a year or more, and I've made a few purchases. As a retired broadcast engineer and theatrical sound man, I especially appreciate the outstanding audio quality of your releases! I just want to wish you guys a very Merry Christmas and happy new year! You have no idea how much joy you have given me these last couple of years and I am sure it will continue indefinitely. I am never anything less than completely satisfied with your marvelous products! I don't think I have ever had any dealing with a better, more efficient and friendly company and one who's products are always amazingly well produced!So a BIG thank you from across the pond and I will eagerly await your forthcoming releases and finds (STILL can't believe you located more lost Fibber and Molly episodes! WOW!). Just keep going! You're one VERY important company!